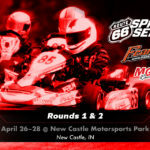 In just a few short days, the Route 66 series presented by MG Tires and Franklin Motorsports will be hitting the asphalt at the popular New Castle Motorsports Park in New Castle, Indiana. While the track is always popular with the racers, the Dismore family upgraded much of the track curbing over the winter, making this year’s visit even more anticipated. And as promised, the Route 66 staff will be utilizing a different track layout than in previous years, which will only add to the weekend fun for the 155 pre-entered drivers. For 2017, the Series lineup includes 10 classes, up from the 9 last year, with the IAME Bambino Kidkart added for this year. The Bambino will be an interesting story over the weekend, as it has been ordained as the future of kid kart racing in the USA, and Route 66 is the first major series to adopt it. Series officials have already announced that the long-tenured Comer 51 kid kart engine will be fully replaced by the Bambino in 2018, so many are jumping on board now to get the maximum experience with it before next season. Eight drivers are pre-entered for the Bambino, with three of them opting to do double duty in the Comer as well. Comer KK also has a total of eight pre-entries. 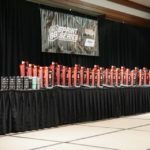 The Rookie level will feature both the Yamaha Rookie, which is well represented with eight pre-entries, and the IAME Micro Swift, which boasts double the pre-entries with 16. Yamaha Rookie will feature a crop of mostly new drivers, as the front runners from last year have moved up, but Kasey Williams will look to move up the ladder after finishing runner up in the final standings last year. Elliot Cox will look to move up to the top step on the Micro Swift Champion’s podium after finishing 2nd in the final standings in 2016. Elliot had two victories last year, but also had two DNFs, including one in the opener at NCMP. Moving up to the Cadet level, Logan Adams and Garrett Adams have to be considered the favorites this weekend in both Yamaha Cadet and IAME Mini Swift. This is their home track, and they have been at the top of their game at every race they have run this year. Last year’s front runners Kaden Wharff and Kyle Thome have moved on to the Junior ranks, so it leaves the door wide open. Last year’s Yamaha Jr runner up, Matthew Northrop, returns this year with hopes of clinching a championship for himself, but this year he moves to the IAME X30 Junior class, where he will likely do battle with his old foe and 2016 Yamaha Jr Champ, Aiden Harrington, as well as Kaden Wharff. This year’s Yamaha Jr class looks to be wide open. Expect Zack Pretorious, James Lynch, and the Della brothers, Zach and Greg, to all be contenders at the season opener. The Yamaha Sr class looks to be an all out war, with 29 pre entries already. Last year it was all Dakota Pesek, who claimed six of the ten victories, with Adam Crepin finishing runner up. These two will both contend again in NCMP, as will past champion, Brandon Lemke. Expect challenges from Alexander Kardashian, Killian Keavney, and newly moved up Sr, Steven Dial. The IAME X30 Sr class should be no less exciting, although last year’s champion, TJ Koyen will not defend his title in favor of driver coaching for the series. 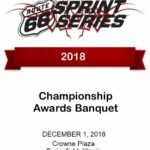 However, last year’s vice champion, Josh Hotz will contest the X30 Sr class, as well as hot shoes Armin Cavcusic, Cal Stewart, Mick Gabriel, and local hero Billy Lewis. The other story this weekend will likely be the implementation of the new push-back nosecone for all classes except kid karts. USPKS debuted the system at the GoPro Motorplex in Mooresville, NC earlier this month, and it quickly became apparent to the drivers that they would need to be more careful when contacting other karts with their nosecone. Route 66 officials have reduced the penalty for a dislodged nosecone, but the penalty is still stiff and many were handed out at GoPro. Expect more of the same this weekend as the drivers become accustomed to the reduced contact. The good news is that the racing was excellent in Mooresville and the number of wrecks caused by over-aggressive driving was significantly reduced. Route 66 will also be debuting their own online broadcast of the live race audio via the Mixlr app (Route66KartRacing) and on the Series website at route66kartracing.com/live. The live broadcast will commence with Qualifying on Saturday. © 2019 Route 66 Sprint Series.